There has been a lot of debate about the wisdom of government investment in clean energy. A guest column by Todd Myers ["Subsidizing green industry is like propping up a kid's lemonade stand," Opinion, Oct. 11] likened it to parents paying for all the lemons and sugar for their kid's lemonade stand, and getting nothing in return. But in Washington, the actual examples of government investment in clean energy have delivered tangible economic and environmental benefits, especially to rural areas. Made in America, 58 elegant wind turbines are being installed near Oakesdale in Eastern Washington. They are nearly ready to supply more than 30,000 Avista Utilities customers with clean, reliable, renewable energy. The Palouse Wind project has brought more than 100 construction jobs to the area; when completed, it will contribute around $700,000 in taxes each year -- for two decades. Portland-based turbine manufacturer Vestas will employ more technicians from its Dayton office, and Oaksdale will receive its first meaningful investment in over a generation. The owner of Oaksdale's only grocery story told a reporter his business has already increased by about 10 percent. "It just brought more people to town," he said. Americans have benefited from federal energy incentives for over a century. Loans from the federal government brought our region the Federal Columbia River Power System, and along with it, some of the nation's richest agricultural lands. Direct tax credits were in place for 23 years to spur the development of unconventional forms of natural gas, and today America is harvesting more natural gas than ever before. American taxpayers have paid more than $500 billion to fossil-fuel industries, which received five times more in government incentives than the renewable-energy industry in the critical startup period. After 90 years of support to the fossil-fuel industry, the federal government still provides incentives worth more than $4 billion each year, which are permanently embedded in federal law, according to a DBL Investors report. By contrast, the wind industry's primary incentive is the Production Tax Credit (PTC), a performance-based incentive that attracts more than $15 billion a year in private investment. Renewable-energy investments in Washington state now exceed $8 billion, with counties receiving more than $40 million in taxes paid to date, our analysis shows. Despite popular rhetoric, the tax credit is cash-positive for taxpayers: increases in federal, state and county tax receipts generated by the private investments spurred by the tax credit far outweigh -- by more than $700 million -- the forgone tax revenue from a one-year tax-credit extension. In 2006, voters in Washington passed the Clean Energy Initiative. We now celebrate the fact that all 17 Washington utilities operating under the initiative met their 2012 objectives. We can also take pride in the fact that Washington was an early leader in wind power, with the first utility-scale project coming online in 2001. Today it stands sixth in the nation for installed wind energy. According to a resource assessment from the National Renewable Energy Lab, Washington's wind resource could provide 64 percent of the state's current electricity needs. The tax credit will expire at the end of the year unless Congress takes action. Experts say that if we keep it in place, more than 500,000 more jobs will be created in the next 20 years. 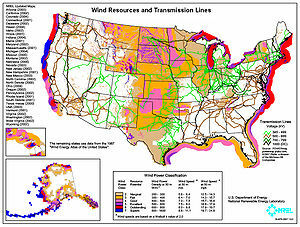 By then, wind will generate 20 percent of America's electricity. The tax credit is a rare example today where Democrats and Republicans can agree. U.S. Reps. Dave Reichert, R-Auburn, and Adam Smith, D-Tacoma, both pro-business, free-market legislators, are co-sponsors of the tax-credit extension bill. The federal government can play a key role supporting investments in our communities that help sustain rural lifestyles while making our economies stronger. It's time to put aside partisan bickering and specious arguments, and work together for the near and long-term benefit for us all.